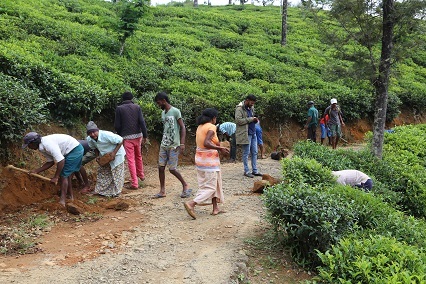 Community members clearing the roadsides through a ‘shramadana” activity. 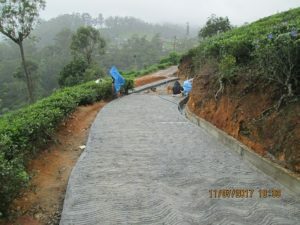 UN-Habitat, with funding from the Korea international Cooperation Agency (KOICA) has commenced several community infrastructure initiatives in Nuwara Eliya district to contribute towards human development of the people in the area. The Human Development Initiative through Empowerment and Settlement Improvement in the Plantation Settlements in Sri Lanka (HDI) Project is implemented by UN-Habitat in close collaboration with the Ministry of Hill Country New Villages, Infrastructure and Community Development. In total, 15 community infrastructure interventions have been selected in consultation with community members at Community Action Planning (CAP) workshops in a number of GN divisions. These interventions include Multi-Purpose Community Halls, retaining walls, Early Childhood Development Centres and internal access roads. The completed stretch of the road with storm water drain. The community of Jayalathpura village in Agarapathana GN Division in the Nuwara Eliya DS division, had selected the construction of a concrete roadway with a storm water drainage system for their village as the current road is in a dilapidated condition with large pot holes. Following a “shramadana” (voluntary work) by community members to clear the sides of the road of debris and overgrown vegetation, a ground breaking ceremony with Buddhist religious observances was held to evoke blessings on the road construction. The construction work began in early June with the Waverley Estate Workers Housing Cooperative Society (EWHCS) implementing the project with technical assistance from UN-Habitat. The Waverley EWHCS and other CBOs in the area, government officials and the Agarapatana Plantations Ltd are actively involved in this initiative. At present, over 296 feet of the roadway has been completed. One complete, the concrete road will be 2,100 feet in length with a storm water drain. Environmentally friendly methods are incorporated into the road rehabilitation work to ensure sustainability. These include turfing the sides of the road and planting selected trees species and bushes to strengthen the road edges and to minimise soil erosion. As this road connects to agricultural lands where large scale vegetable cultivation is undertaken, the road rehabilitation will greatly benefit livelihood activities of the community, especially farmers. In addition to the community infrastructure interventions, UN-Habitat is also conducting vocational training programmes for youth in Nuwara Eliya district to improve their employability. The HDI project is contributing towards human development through capacity building of youth, communities and local authorities; increasing resilience of the communities through settlement planning and community infrastructure; and through awareness creation towards mainstreaming plantation settlements. It is expected to benefit over 3,058 persons directly and 250,000 persons indirectly in Nuwara Eliya district. The project will be implemented from January to December 2017 in the Kothmale, Nuwara Eliya and Walapane Divisional Secretariat divisions.